Download AirUpdate - Download It! AirUpdate uses the same text file format for output as it does for input. 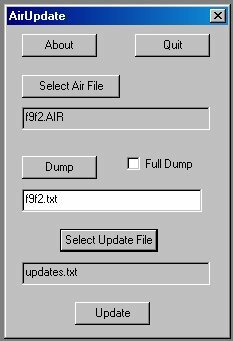 You can dump air file records to a text file, edit the records in the text file, and then use the edited records in the text file to create a new air file or update an existing one. You can edit data directly in a text file, or you can copy it into a spreadsheet, chart it, modify it, and copy it back to a text file. How you edit the data is up to you. 1) Start AirUpdate. Click "Select Air File", navigate through your directories and select the air file you want to dump. 2) Click the "Dump" button. 1) Start AirUpdate. Click "Select Air File", then navigate through your directories and select the air file you want to 'update'. 2) Click the "Select Update File" button, then navigate through your directories and select the update text file you want to use. 3) Leave the 'Update' box unchecked and click the "Apply" button. Note that AirUpdate does not modify the original air file. The original file is first renamed by adding a number to its name, then a new file is created using the original file name. The original file is always saved as a backup. 1) Start AirUpdate. Click "Select Air File", then navigate through your directories and select the air file you want to update. 2) Click the "Select Update File" button, then navigate through your directories and select the update file you want to use. 3) Check the 'Update' box and click the "Apply" button. Again, note that AirUpdate does not modify the original air file. The original file is first renamed by adding a number to its name, then a new file is created using the original file name. The original file is always saved as a backup.